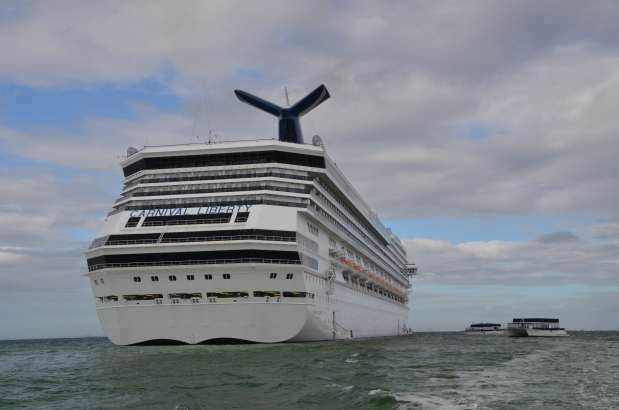 Carnival Liberty, the first ship to undergo the Funship 2.0 transformation, has many dining options – most of them free. 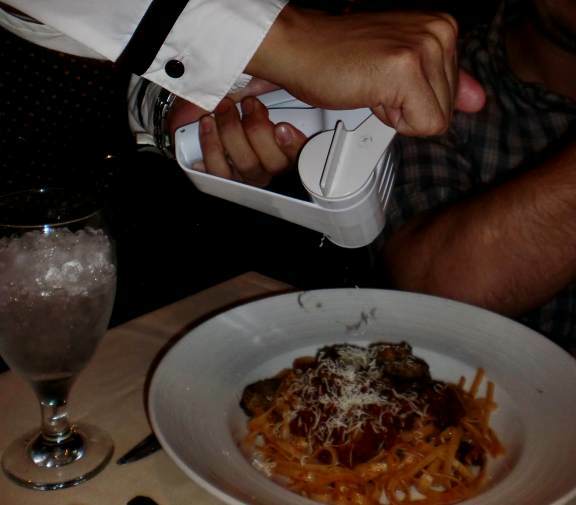 The only regular mealtime eatery on the ship that costs extra is the steakhouse. Liberty has two main dining rooms, the Gold Olympian and the Silver Olympian. Passengers can still choose specific dining times where they have the same table at the same seating each night. This option works for folks who like the traditional dinner time seating and the chance to make new friends that they see daily at dinner. The downstairs level of the Gold Dining Room offers the newer “your time” dining. Passengers choosing this option can come any time during the dinner service and will not necessarily be seated at the same table every time. A great new option for those who like to keep their schedule open so they can eat at whatever time they find convenient that day. Both dining rooms serve the same dinner menu. The silver dining room also serves breakfast, lunch, and on sea days Carnival’s best kept secret – afternoon tea. 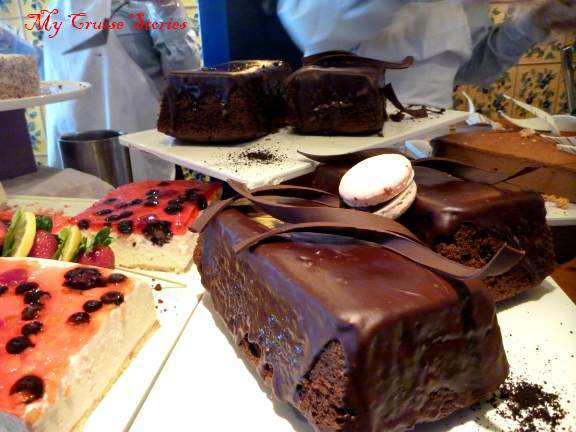 We found some of the best goodies of our whole cruise at the afternoon tea. Dinner menus change daily, although they do offer Carnival’s signature Chocolate Melting Cake as a dessert option each night. Every cruise has at least one formal night where lobster will likely make an appearance on the menu. We found the staff quite friendly and attentive. 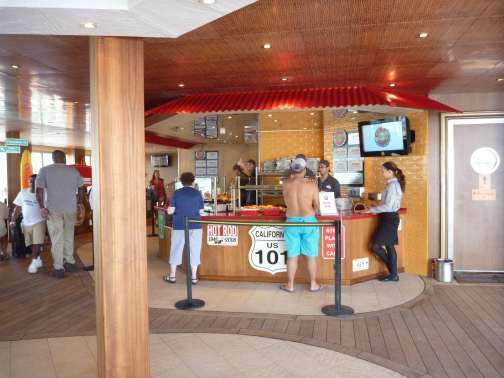 The Lido deck offers many other dining options for passengers. 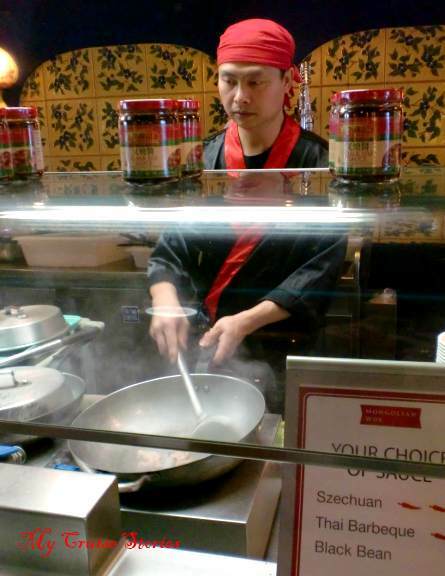 It has Emilio’s buffet, a deli, Mongolian wok, pizza, and ethnic places serving things like Asian or Italian food. There’s also a fish and chips place upstairs and late night hot dogs or sandwiches near the aft Lido pool. If that’s not enough they have 24 hour room service and the aft self-serve soft ice cream station on the Lido deck stays open round the clock. Since the Liberty has the Funship 2.0 additions, the Lido deck also is home to Guy’s Burger Joint and the Blue Iguana Cantina. The Blue Iguana serves tasty breakfast burritos as well as lunch and dinner with delicious taco and burrito selections. Passengers can customize with quite a variety of choices to put in their taco or burrito. It had a salsa bar nearby with all sorts of toppings to add to the burritos or tacos. We loved the Blue Iguana Cantina. 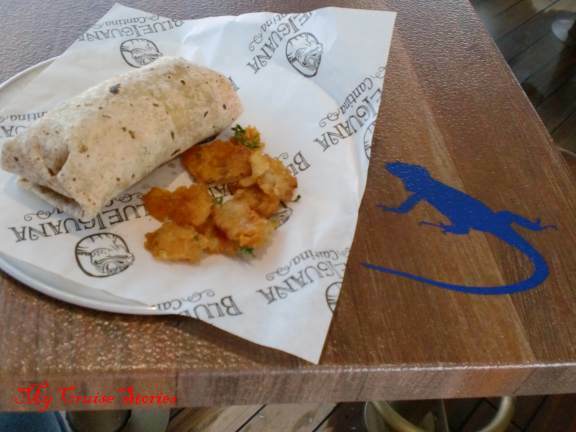 We found the Blue Iguana’s willingness to give people whatever they want quite the opposite of Guy’s Burger Joint where they live up to their motto – Have it Guy’s way, NOT your way. We sailed on the Liberty on one of its first cruises after the 2.0 transformation and already other passengers had requested Guy’s serve other burger options for people who don’t eat beef. Being non-beef eaters, we did not get to try Guy’s. I used to enjoy watching Guy Fieri’s TV show, Diners, Drive Ins and Dives. Ever since our trip on the Liberty, if Triple D comes on we say “Oh THAT Guy,” and change the channel. I sincerely hope he has listened to the passengers and started offering people the opportunity to sub the beef patty for a turkey or veggie patty by now. We will find out soon on our upcoming voyage on Carnival’s brand new Breeze. If Guy’s has options other than beef I may even watch Diners, Drive Ins and Dives again. I did used to like that show. On one episode Guy ate a turkey burger and LIKED it….so why didn’t his menu include them on the ship???? 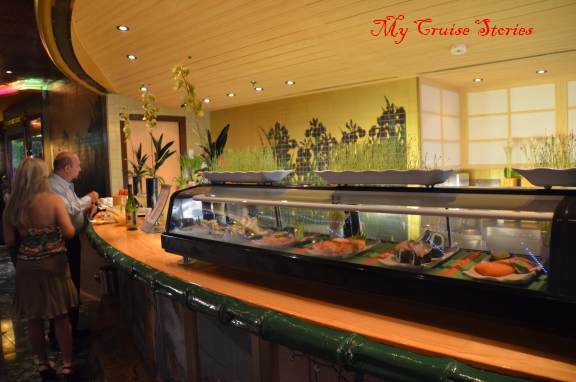 Down on one of the lower decks, Carnival Liberty has a sushi bar. People tend to walk by thinking it costs extra, but it doesn’t. The sushi is there for the asking. It is just open for a short time each evening so sushi lovers need to make sure and get there at the right time to get some. 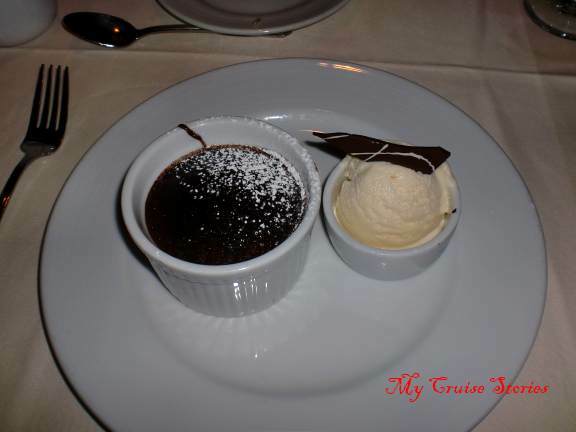 One thing we always look forward to each cruise is the late-night chocolate or dessert buffet. When we sailed on the Spirit quite some time ago, Carnival had them too. It turns out they quit having the late night dessert buffets a couple years ago to save on waste. They have new desserts each day on the Lido rather than serving things left from the previous night like some other ships. 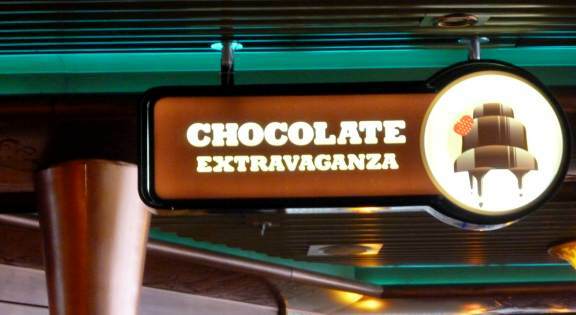 They do still have a chocolate buffet of sorts, during lunchtime on the Lido one day out of the cruise. They call it a chocolate extravaganza now. It’s not a whole deck full of chocolate, just one station, but still enough chocolate choices to make an entire meal of dessert. 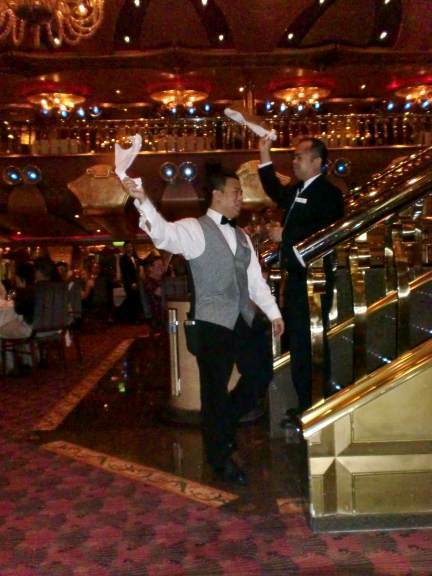 Passengers on special diets, such as gluten free, can meet with the maitre’d on the day they board the ship to insure their meals meet their dietary needs. This entry was posted in Caribbean, Carnival, Cruise Food, Liberty, Shipboard Life and tagged Carnival, cruise, cruise food, food, Liberty, photos, travel. Bookmark the permalink. I can’t wait to try all of the great food on the Carnival Breeze. 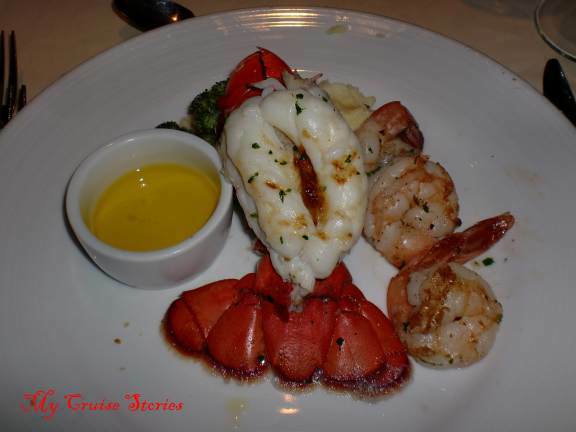 While aboard I will be doing lots of food and wine reviews for http://www.MyTravelTastes.com Be sure to visit the site next month for updates! Very impressive restaurants. Great looking and I’ll bet the food is delicious. Would be fun to go on a cruise some day and try all the restaurants, even Guy’s Burger Joint….I wonder what burgers their way taste like?! Unlike Mom I do love a good burger but was dissapointed with Guy’s burgers. They were very salty. I only had the burger once. The Blue Iguana burrito place was great though.